Medicine is constantly progressing, in part due to technological advances of today’s digital age. In ophthalmology, one of the most important recent technological advances has been the development of optical coherence tomography, or OCT. Within the past ~25 years OCT has risen to be ubiquitous in the field, with applications in nearly all sub-specialties and for countless clinical purposes. Given our recent Podcast Episode’s (link - http://www.retinapodcast.com/episodes/2019/1/6/episode-148-january-2019-retinal-physician-review-including-digital-imaging-in-vr-surgery-surgery-in-rop-eyes-vkh-achromatopsia) discussion on the growing use of intraoperative OCT, for today’s Lessons from our Pupils blog post, we wanted to take a look at the history of OCT and to cover some basics of the science behind it. Optical coherence tomography – the name itself gives the reader a good idea about the principles at play. Optical, in the world of physics, suggests involvement of the visible portion of the electromagnetic spectrum. Coherence refers to the state in which two waves are in sync (called “in-phase”) with each other. And finally, tomography refers to imaging through slices (“sectioning”). We could assume that OCT, then, should involve the use of two waves of light (and whether or not they are in-phase) to image a slice of an object. At this point, we should probably wrap up this blog post, since we already went over all there is to know about OCT! For those who would like to keep reading, let’s dive into some more specifics. As you would expect with the word “coherence,” OCT requires the comparison of two different waves of light, produced by a beam splitter inside the machine. 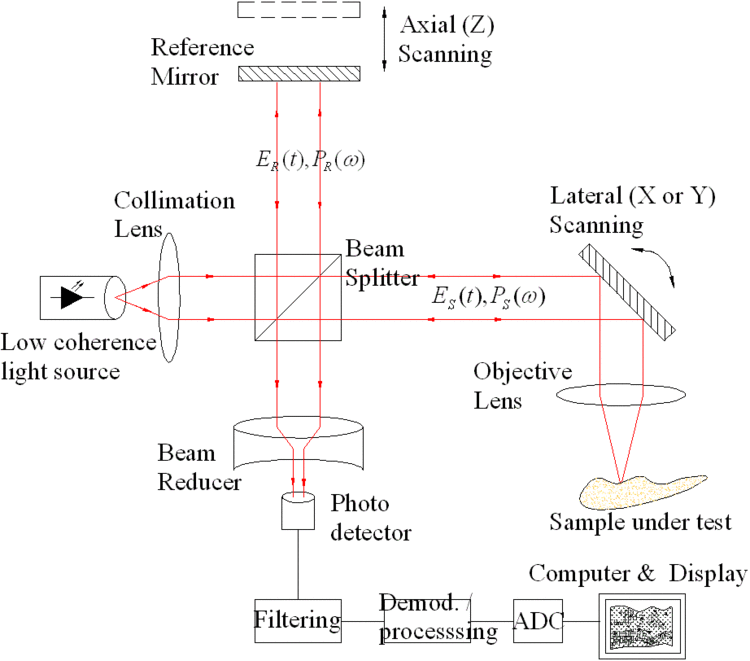 One beam travels to a “reference mirror” while the other beam travels to the sample you are trying to image. When the beams of light return to the device, they are merged together in a beam reducer and analyzed using a photo detector. Depending on how in-phase or out-of-phase the two beams of light are when they return to be merged, the computer can assign different intensities to that portion of the sample, which is then repeated thousands and thousands of times to create the final image. The specifics of this process, however, varies based on OCT type. There exist two “domains” for analyzing coherence: the time domain (TD), and the frequency domain (FD). In the time domain, the time it takes for the beam of light to travel to the reference mirror and back to the photo collector (the “reference arm pathlength” is altered through movement of the reference mirror; this allows “scanning” different depths of your tissue sample. In the frequency domain, different frequencies of light (which penetrate to different depths of the tissue sample) are included in each beam, and these frequencies are detected in parallel using spectrally-separated detectors; this allows for much greater speed of analysis, since the reference mirror does not need to be moved for different sample depths to be analyzed. While the initial TD-OCT systems could perform 400 axial scans (A-scans) per second (low due to the need to move the reference mirror), use of the FD for Spectral Domain OCT (SD-OCT) can be performed at ~300,000 A-scans/second (though most clinical systems operate at rates below this). Since we can acquire images so much more quickly, we are now able to perform three-dimensional scans of tissue. Although you may not deal with the physics behind OCT in your daily clinic, it is always nice to learn a little bit about what goes into the technology that we use. We hope that you enjoyed reading about OCT and we are excited to see just how far this technology will go, both in the field of ophthalmology and beyond.